What jumped out at me while I was reading these two blogs was how logical this has always seemed to me. In fact, as Aubrey notes, several exegetes have presented these thoughts in some great commentaries over the years (several of which I’ve had the pleasure of reading). Interesting thoughts. I tend to agree. Amen! The fruit of a spirit filled life are to be gained only as a result of living a spirit filled life! dude, this is pretty pentecostal of you. maybe youre finally coming around! Dr. Glazer, if I understand Luke and the authors correctly, that is not what they are saying at all. But is does beg the question…what do you do to be Spirit filled in the first place? We cannot live the Christian life as if it is a convenient set of rules for us to somehow force ourselves to obey. But, as we choose, by God’s grace, to obey by the Spirit, then doesn’t God give us a measure more of the same grace, to make the next choice for obedience just a bit easier? I would say to Mr. Kirk, however, that no one can “make” someone submit to them. Those who think they can “make” someone submit to them are teetering dangerously on the edge of abusiveness. The scriptural definition of “submit” is to choose by an act of one’s will to do what someone else wills us to do. God never forces us to submit to him, and if he did, it would not be submission, it would be subjection (or slavery). It is only submission when we choose to do something that someone else wants us to do. If someone obeys you because you forced them, then you have been an abusive dictator that has subjected someone else into a slave-like position. You have forced them to obey, but you have not forced them to submit, because submission can never be forced. It must always be a freely made choice. Tony, as you well know – I am not Pentecostal. I find the biblical reasoning and the experiential motivations lacking (as you well know… ha ha). However, since I am a Continuationist and have experienced some of the spiritual gifts described in 1 Cor. 14, I suppose we can move past the Pentecostal distinctions! Novice, I actually don’t think Dr. Glazer was that far off… or maybe I’m misunderstanding his point (or didn’t clarify my own?!?!?!). The fruits of living a Spirit filled life are results of being spirit filled in that all the fruits that were listed in the above blog (ministering to one another, singing songs, submitting to people, etc.) are results of being Spirit filled. They are not, according to my understanding of the Greek, necessarily imperatives (as many peope think). Rather, they are the natural outworkings (results) of being Spirit filled. Perhaps I misunderstood his pont though. I thought he was in agreement with the idea that the “fruits” (or results) are products of the “experience” (to use Charismatic terms). Regarding how one is filled with the Spirit… I would suggest that Pentecostals are incorrect in that they limit the “baptism of the Spirit” (their term for this experience) to a secondary action that occurs distinct from your salvation experience (Justification). Evangelicals of the non-Pentecostal variety suggest that the “baptism of the Spirit” occurs at the “born-again” experience and leave it there. I’m somewhat inbetween. I dislike the term “spirit filled” Christian because I believe the Bible clearly teaches that every Christian in “Spirit filled” (even Cessationists!). Yet, I can’t write off the fact that the apostles were “filled with the Spirit” multiple times in the book of Acts and these “events” or “experiences” were very similar to what Pentecostals / Charismatics describe. One must also note that the events in Acts were distinct from the being “born again” aspect of our relationship with God. Which, brings me to the point of Ephesians 5’s statement to “be continuously being filled with the Spirit” (literal translation). I apply the term “baptism of the Spirit” to the moment when one is “born-again” into the Kingdom of God. 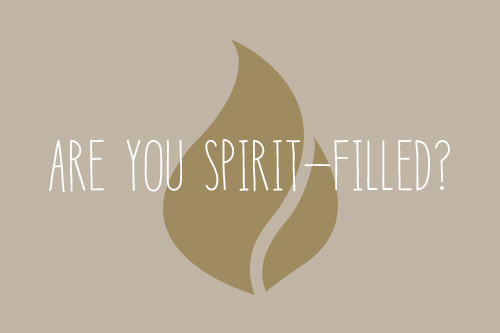 I use the term “filled with the Spirit” when referring to secondary (and third, fourth, fifth, etc.) events where one is “filled” with the Spirit. So, I believe classic Pentecostals are incorrect because they place emphasis on a one time event (I realize many Pentecostals are moving away from this belief). I believe Evangelicals are incorrect because they minimize the importance of the secondary experiences of the Spirit. I guess, once again, it seems the balanced approach is best. I have always found this approach to be the most biblical and when I finally heard several scholars present it… I knew I could hold my convictions and not be the only “cooky” non-Pentecosta Charismatic Evangelical… errr. Speaking from an Evangelical viewpoint for a moment, let me suggest that the distinction is not whether to minimize the secondary experiences of the Spirit, that the more “Evangelical” view goes back to the continuous tone of Ephesians 5. If asked to differentiate the views, the Evangelical answer would be that the role of the Spirit in our lives should not be interstitial but foundational: not “experiences” in the context of “normal” life, but the continuous normative experience of life; not bolts of lightning, but the glow of the sun. The views of “Spirit filling” differing in the same way as 2 explanations of how water fills a lake: the pentecostal sees the rains that flood the creek that fills the lake, while the evangelical sees the spring that continuously feeds the lake. For all, the goal is a life of “filled” submission that produces the results God desires. In either viewpoint, we should long to “keep on being filled”, living a life of increasing submission to, dependence on, and empowerment by the Spirit. Unfortunately, we too often get the process backward: we treat the anticipated results as demands and try to produce them through our own strength, something God never intended. The difference is the very distinction TimbrelDancer makes between submission and subjection: since our world doesn’t understand the source, they can’t comprehend the difference in results either. Those who know God are supposed to know better, but when we get this wrong, rahter than “letting the river flow”, we’re just all wet and the world around us wants to tell us to go soak our heads. Fortunately, the Ephesians passage above is passive voice, meaning that God does the filling, not us. If there is a command implied in the verse, it is that we should keep from getting in the way. Whether we are “non-Pentecostal Charismatic Evangelicals” or “end-time-cessational/charismatic dispensational evangelicals” (and you think you’re kooky? ), God desires that we “may be filled with all the fullness of God” (Eph 3:19 ESV). Now that’s FULL, so none of us are there yet!!! Good topic! It was good to meet you in person on Sunday, by the way! Since I’m down in the opposite corner of the state, it’s nice to put a face to the comments. Maybe I misunderstood the both of you (Luke and Dr. Glazer). I took one of the meanings of the blog post as “the fruits are merely the result of being filled with the Spirit…not some activity we are commanded to do” and Dr.Glazer’s comment as “go do all of those things and then you will be filled with the Spirit, which will lead to more of those things”. The difference (in my interpretation) being, 1) those things result from being filled vs. 2) do those things to get filled and it will lead to more. Michael, great post. I agree. Perhaps there is someone out there that I can agree with regarding the issue of the Spirit (ha ha… okay… maybe not)! As you somewhat noted, what makes the Greek somewhat fun is that it is imperative present passive. So, I like how you suggest that we get out of the way! Yet, we also need to apply the other passages, such as Luke 11:5-13, specifically v. 13. There is certainly Scriptural precedent for the human activity of asking for, seeking for, and knocking for “experiences” with the Holy Spirit. If we approach the text in Ephesians with this in the back of our mind, we understand that God’s activity of filling us with His Spirit occurs as He sovereignly wills… yet we respond by receiving it and carrying out the normative products that are result of the filling. And yes, it was wonderful to meet you as well! Speaking of which… tell me more about yourself?!?!?! You live down south… you came to Stanley… what else?!?!?!?!?! Novice, I hold to item #1 of your two suggestions. I guess that is what I thought Dr. Glazer was saying. Maybe I was wrong. Afterall… his Ph.D. is in spiritual formation… he’s not a real theologian or a real exegete! By the way… for those who won’t get that last joke, I’m kidding. As Dr. Glazer and I have often joked about, folks whose discipline is in the area of spiritual formation get a bad rap! NT Scholars rarely take them seriously. Errr… Dr. Glazer is a fantastic scholar and a fantastic teacher. I love him! What about 2 Tim. 1:6 – For this reason I remind you to fan into flame the gift of God, which is in you through the laying on of my hands. Isn’t this the gift of the Holy Spirit? The Holy Spirit will not force himself on us. We need to do our part and put to use the gift which is in us. Doesn’t the Holy Spirit work also along with the Word? How can there be fruit from one of these without the other? Without Jesus, the Word, how can we even have the Holy Spirit? I love verses 26-27 which talks about washing with water through the word. It’s all about imitating God (Eph.5:1) therefore needing both Word and Spirit to produce fruit. Where I tend to get lost in these type of discussions is in the area of what I am supposed to do. Am I supposed to seek for the Holy Spirit’s work in my life or is that an empty search and a waste of time? Some well known pastors on the radio imply this. And yet, others seem to say that is all that we’re supposed to do! I struggle with figuring that one out. Anyone else? My understanding is that we should seek to enable the Spirit’s work in our lives, based on a whole variety of verses like Psalm 139:23, Matthew 11:29, Romans 8:27, James 4:10, and Rev 3:2-3 among many others. The mistake is in trying to accomplish this through human effort and carnal strength, rather than through the power of the indwelling Holy Spirit. The error to avoid is in thinking that we can produce godliness in our lives by own own actions (legalism) or that we don’t need to think/do/be/live differently than the world (carnality). The balance is to wholeheartedly throw ourselves into letting God do his work, as the Phil 2 passage discusses. We are told to think like Jesus in Phil 2: 1-13, who humbled himself and was obedient to the Father. Only when we are united with Christ, in the fellowship of the Spirit (v. 1) can we be one in spirit and purpose with him. That connection is the key, in my opinion, so DKotecki is right that this involves both us and God at the same time. We fan, the Spirit burns!